Is the Water At Fort Rucker Safe To Drink? Yes. Fort Rucker's water is tested regularly and meets all the standards. Details are contained in our annual Consumer Confidence Report which can be obtained by calling (334) 255-1761. Most of Fort Rucker's drinking water comes from wells which are closely monitored and maintained. Seven wells collectively provide potable (drinkable) water to the main cantonment area of post, and to Hanchey, Knox, and Lowe Airfields. 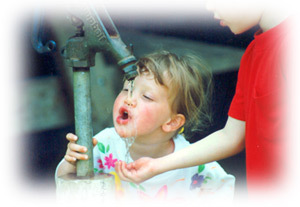 Several other wells provide water for uses such as training, firefighting, and recreation. Cairns Army Airfield is supplied by the city of Daleville, and Shell Army Heliport is supplied by the city of Enterprise. Fort Rucker and our neighboring cities must all comply with the same drinking water regulations. All well water we use is treated with chlorine for disinfection. Fluoride is added to those the water in the main cantonment area for the dental health of resident children. Fort Rucker's water system is overseen for compliance at the federal level by the Environmental Protection Agency (EPA), and at the state level by the Alabama Department of Environmental Management (ADEM). Federal and state inspectors visit Fort Rucker periodically to review our water system and the operational records we submit to ADEM monthly. Who Is Responsible For The Water System On Fort Rucker? In April 2004, a private company, American Water Military Services, took over long-term operational and regulatory management of Fort Rucker's drinking water system. This is referred to as "privatization", and it benefits the Army since the new owner/operator is responsible for making all capital improvements to the system, including replacement of all old pipes and lines over the next 10 years. The Directorate of Public Works (DPW) Engineering Division will monitor the private company's performance on behalf of the government, and can be reached at (334) 255-1709. How Do We Monitor Water Quality? Consumer Confidence Report - provides an annual comprehensive summary of our drinking water quality. This document is distributed widely on post each year, and can be accessed from the link under "Documents"
What Is The Difference Between Regulatory Standards and Aesthestic Properties? Aesthetic properties mean the water's appearance, odor, or taste. This is a separate issue than the regulatory standards which define whether the water is safe to drink. There are many reasons why the water's appearance, taste, and odor may not be desirable. These effects may be due to something in the water system's design (for example, if an old World War II building was designed for a higher water use than the current use; i.e., older barracks buildings designed for many latrine and shower users, but current usage is only a small group of administrative employees). When water is not being flushed through pipes in the manner or volume for which it was designed, aesthetic issues can result. In other cases, some of the older metal pipes may be rusting, and some of this rust can leach into the water. The water's aesthetic properties may also be affected temporarily if repair or other work is being done nearby. If you have concerns about the aesthetic properties of your water, the most effective way to deal with it is to contact the Environmental Health Section at 255-7380 or 7327. They have trained professionals who can speak with you in more detail, and can provide guidance on water issues. They also have technicians who can come on-site to evaluate your situation and collect samples, if necessary. If a problem is identified which requires certain maintenance or corrective action by the government, the inspectors will issue a written memorandum to ensure timely follow-up action on this type of issue. 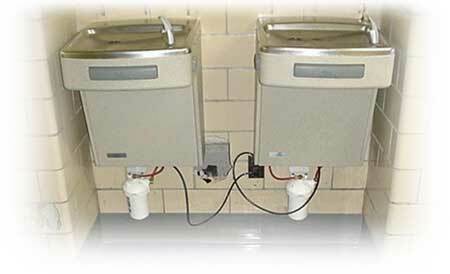 Does It Help To Install Filters On Faucets Or Water Fountains? Many people nationwide believe strongly in using filters on their water fountains or faucets, and that the water will be safer to drink as a result. This is a misconception. A filter will only help with aesthetic properties of the water'appearance, odor, or taste. The filter is not providing any health protection. Our water system does not pose a health risk on Fort Rucker, Cairns, Shell, and the stage fields because our our monitoring and sampling indicates that we are meeting all the safety and regulatory standards. If you have a government-approved filter installed in your work or home on Fort Rucker, Cairns, Shell, and the stage field to fix aesthetic water issues, the DPW Self-Help Store carries filter replacements. It is your responsibility to change them out. If you have a filter installed which was not government-approved, it is your responsibility to procure replacement filters at a retail store at your own expense. Although the measures we take to treat and monitor our water are important, one of the best ways to ensure water quality is to protect the source of the water from contamination. Fort Rucker recently completed a program to protect our water wells as required by federal and state regulations. It is called the Source Water Assessment Program. Under this program, we are required to identify potential contaminant sources which could pose a risk to our well water, determine (with the help of the state) if they were a low, medium, or high risk to the wells, map contaminants in the well areas that they potentially affect, and provide information about the program to the public. These actions were completed, and two public briefings were held to discuss the program and how to find out more for those who are interested. An example of a potential contaminant source to a well area on Fort Rucker is a 500-gallon diesel oil tank. Although it is near a well area, it was considered to be a low risk because there is a concrete containment wall and pit built around it that would contain any oil if a leak or spill occurred. Additionally, we have spill and emergency response procedures in place on Fort Rucker which would enable us to quickly deal with the problem if a catastrophic event occurred and the containment wall failed. This program does not replace other things we do for the water system, but is one more way of ensuring our users have the best water quality possible. The Safe Drinking Water Act, passed in 1970, gave the Environmental Protection Agency (EPA) the responsibility for setting national drinking water standards that protect the health of millions of people. They were also given the authority to enforce these standards. Since 1970, the EPA has set national safety standards for over 80 contaminants. This means that operators of public water systems must sample and monitor the water for these 80 contaminants, and the water cannot exceed the established level for each contaminant. To meet the established standards, water system owners must treat the water, maintain the distribution systems that deliver the water to users, and report on their water quality to the state. Cities, private suppliers, federal facilities, and even Fort Rucker are subject to fines and other penalties if they fail to monitor a certain contaminant in the water, or if they distribute water to users with contamination above the established standard. The contaminant groups that are being monitored by water system owners are biological contaminants (bacteria, coliform), total trihalomethanes or TTHMs (a byproduct of the chlorine disinfection process), lead and copper, other inorganic and organic chemicals (such as metals and fluoride), nitrates, regulated volatile organic compounds or VOCs (such as benzene and trichloroethylene), unregulated VOCs (such as chloroform and naphthalene), and various synthetic organic compounds. Other physical or biological components in the water system are monitored continuously using automated equipment, and the data must be submitted monthly to the state. When there is a violation of a drinking water standard, the water system owner must notify the users. This notification may come through a variety of forms, including as a mail notice or flyer which comes in the mail, public notice or announcement, newpaper notice, or another way. In cases where there is an immediate health threat (such as one that would require boiling water before drinking it), the water system owner must use more immediate and aggressive means to notify the public such as television, radio, newspapers, or delivering information in person or door-to-door. 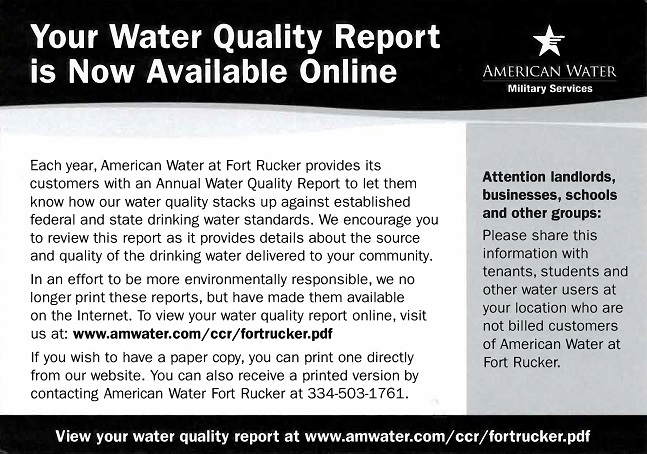 If you have not received any notices like this while living or working on Fort Rucker, there are no problems and your water is meeting all the standards. Do I Need To Worry About Conserving Water? You can read much more by searching the internet for "water conservation".